I drove up to Ogunquit, Maine yesterday. It's a beautiful quaint town on the ocean and it was a perfect day, so I went for a long walk along the seashore. 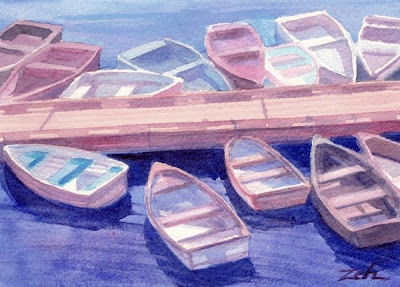 At the fishing harbor, this scene caught my eye - colorful boats lined up at a dock.